Home » Social Media » Facebook Retargeting: What Is Retargeting and How Can It Help Your Business? If anyone tells you that it’s easy to get traffic to your website, they are just plain lying. It can take some time to attract enough people to your website to turn a profit. And then when you DO finally attract a healthy amount of traffic, a large percentage will leave your site without any interaction, never to be seen again. But, what if you could somehow recover that lost traffic and entice them to buy again? How would that boost your business, sales and conversions? Well, you can reclaim that traffic by taking advantage of a tactic called retargeting. And retargeting can do more than just boost business; it can equate to massive gains. Website visitors who are retargeted with display ads are 70% more likely to convert. In addition, the average click-through rate for retargeted ads is 10 times higher than for ads without retargeting. This article is the first in a five-part series where we will discuss how business owners can leverage the opportunity Facebook retargeting offers and use it to boost traffic, leads and overall sales. In this first part, you will learn what retargeting is, how it can benefit you and whether or not you should leverage it for your business. Not every visitor who lands on your website signs up to your email list or makes a purchase. In fact, only about 2% of your first-time website visitors take action (and this is high! ), which means that 98% or more of your traffic is leaving your site. Want a second chance to get them back? Retargeting is a form of online advertising that allows you to display your ads to the exact visitors and prospects who visited your website and left. You can literally track (or “follow”) these abandoners on the web and, with your targeted ads, compel them to revisit and reengage with your brand and products. The overall goal of retargeting is to recapture these prospects so they can come back, make a purchase and convert. Though you can use several platforms to execute retargeting ad campaigns, we recommend Facebook since it’s simple to use and highly effective. Have you ever been weirded out when a product you were just scoping out on a website randomly appeared in an advertisement on your Facebook news feed? When a prospect visits your website, Facebook tracks them via a pixel that has been placed on your website (more info on this in later articles in this series). This pixel allows Facebook to track your website visitors’ behavior on your site so you can use this information to retarget them after they leave. When you launch a Facebook ad retargeting campaign, tailor the content of your ads to your prospects’ activity on your website. Let’s say your website visitors added items to their shopping carts but never made it to the checkout because they forgot or they were distracted. 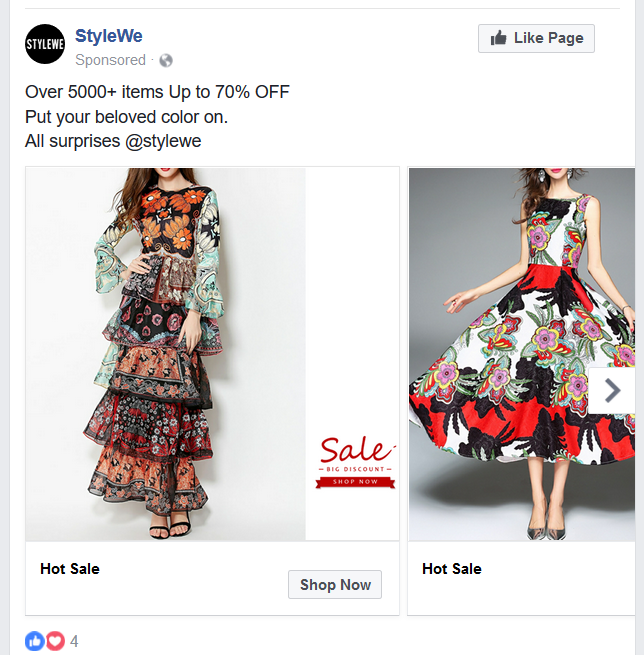 Instead of losing these sales, retarget these cart abandonment customers on Facebook with an advertisement that displays the products they were interested in (the pages they visited). You can even get as specific as mentioning the items that shoppers left in their carts, or target the people who visited the “payments” page but never hit the “buy” button. Here is an example of a dynamic retargeting ad that showed up in my friend’s Facebook news feed. She visited this site recently, so the ad featured a carousel of product styles (including one she was scoping out on the site). The brand also advertised a discount as a way of enticing her to return to the site. Offering discounts to people you know are already interested (those who visited your product pages) is much more effective than sending ads to people who haven’t visited your site and may or may not be interested in your products. And offering a discount to these targets can be just what they need to seal the deal. This is dynamic retargeting in action. Facebook also allows you to upload your list of email contacts and target them with ads. This is an even more targeted form of advertising that can result in powerful gains if you use it the right way. Let’s say you sell lead generation software and you are offering a lead generation e-book on your website in return for an email opt-in. The people who opt in and download the e-book are now familiar with you, and they are likely interested in the topic of lead generation. To increase the chances of them moving through your sales funnel to hopefully purchase your software, set up a Facebook retargeting campaign to show your ad to just these email contacts and offer them a free trial of your software. How Does Facebook Retargeting Benefit YOU? Facebook retargeting offers numerous benefits for businesses. As mentioned before, retargeting allows you to reach the website visitors and prospects you would have otherwise lost. And since Facebook retargeting can result in a 2X ROI for your campaigns, it’s a tactic worth trying. 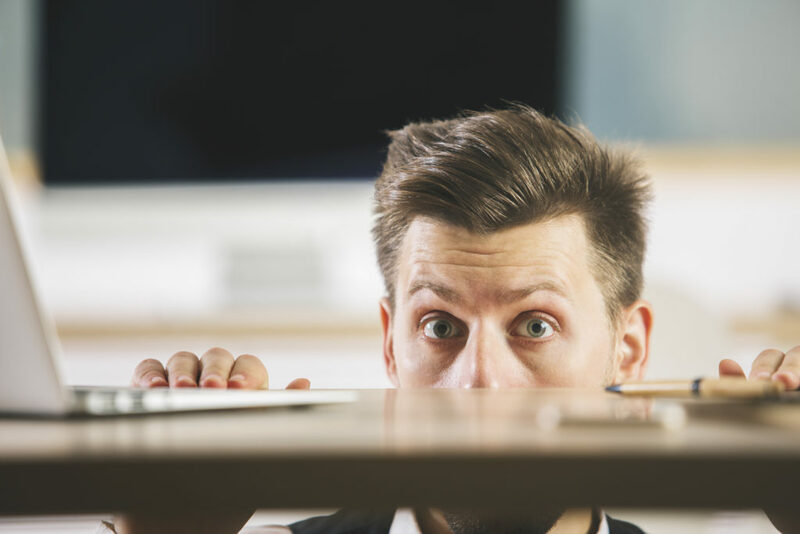 Retargeting can also keep your brand top of mind so your prospects don’t forget about their interactions with your business. Retargeting establishes brand consistency, which is key to creating a strong brand and building trust. More trust equates to higher brand confidence, which equates to increased leads and sales conversions. Three out of five people notice the ads that feature products they reviewed and researched on other sites. 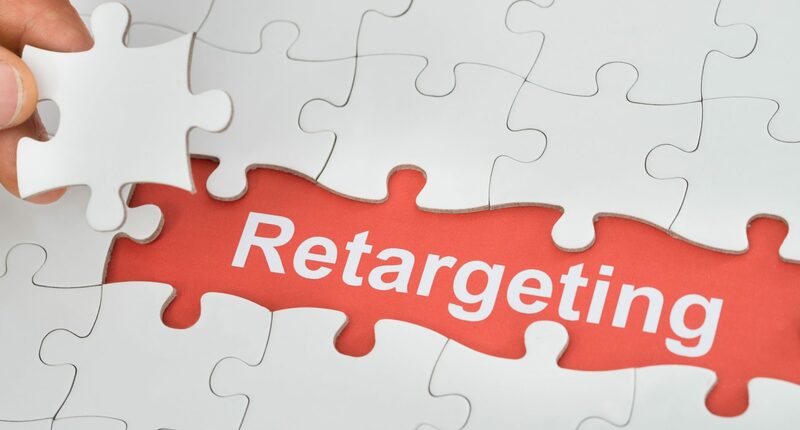 Retargeting increases your ad conversions because you are targeting people who already visited your website and showed an interest in your brand and/or products. This is much more effective than simply targeting people who are likely to be interested in your brand but may not have heard of you. Because the information in the ad can be targeted to your visitors’ behavior, this high level of personalization increases conversions. Facebook is the king of social media and the most popular social network worldwide. As of the last quarter of 2017, Facebook boasted 2.2 billion (that’s BILLION) active monthly users, or people who logged in to Facebook during the last 30 days. Because of Facebook’s massive size, retargeting on the platform increases the likelihood that you will reach your prospects and get your ads in front of them. What happens if you don’t have a lot of website traffic or you want to attract more people who are similar to those you are retargeting? If you are retargeting an audience and your ads are converting well, you may want to expand your ads’ reach. This is where Facebook’s lookalike audiences come in. If you tell Facebook that you want to target a lookalike audience based on one of your current audiences, Facebook will gather people who have similar characteristics and interests to said audience, allowing you to target similar people who may not have heard of your brand. For the best results, create awareness and curiosity ads for lookalike audiences instead of compelling people to sign up for something or make a purchase. The reason is that these people may not have visited your website before and they will not have established trust with you just yet. Here is a good example of an ad that would perform well with a lookalike audience. Notice that it doesn’t coerce people to sign up but rather evokes curiosity and helps build awareness for your brand. 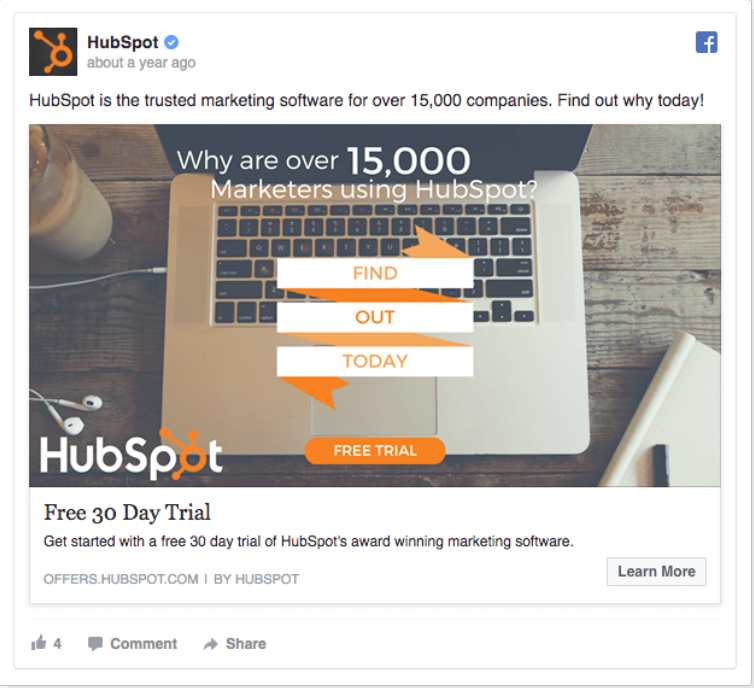 Is Facebook Retargeting Right for You? If you are a business that wants to increase conversion rates and recapture the 98% of people who leave your website without taking action, leverage retargeting to reclaim your lost traffic. Also, Facebook retargeting is not just an e-commerce advertising method. Both B2B and B2C companies can benefit from retargeting prospects throughout their buying journey. Since Facebook is so popular, retargeting can benefit any business whose target audience can be found interacting within the Facebook platform. 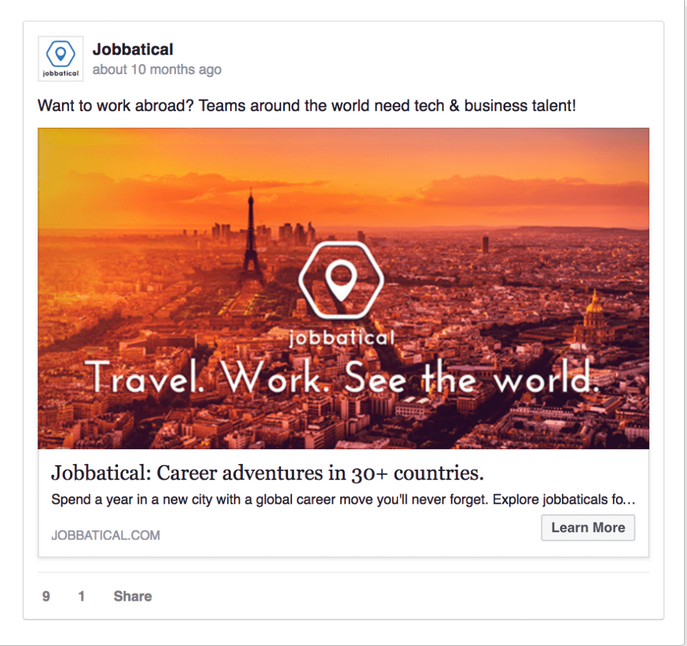 Are you ready to try Facebook retargeting? In the second part of this five-part Facebook retargeting series, we will walk you through what Facebook custom and lookalike audiences are and how to create them on Facebook.